The Sphynx, one of the most popular cat breeds, is a highly entertaining and playful pet that tends to be active and affectionate. The Sphynx cat resulted from a natural mutation that produced a kitten with fur the length of peach fuzz. While this cat was first recorded in Canada in 1966, a number of obscure historical references suggest that the same mutation may have occurred in other times and places. 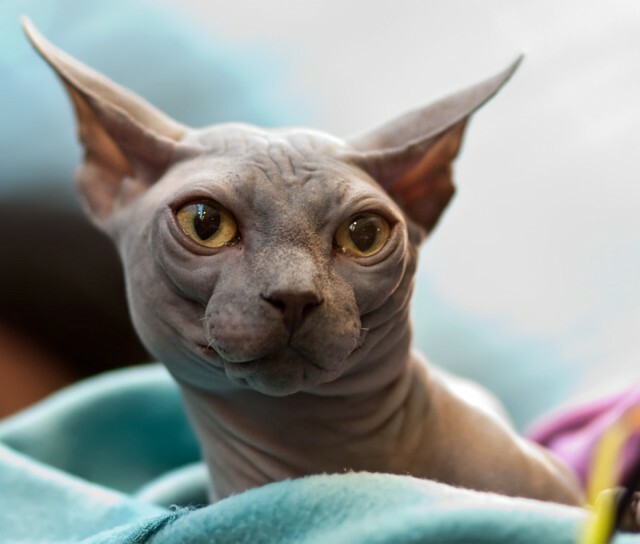 The Sphynx is not actually hairless, as is commonly believed, but rather has a very short downy hair over most of its body, with a texture similar to that of soft suede. Whiskers may be short and curly or absent altogether. The Sphynx tends to have a long, slender body and a long, tapered tail. It has slim, short legs, small paws, and a triangular face with very large almond-shaped eyes. Its enormous ears make it seem as though the Sphynx is always alert and listening. 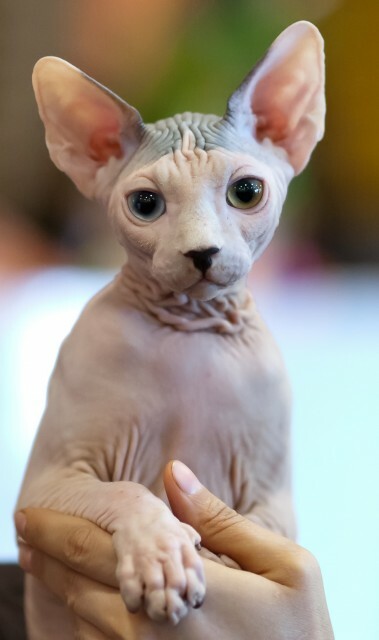 Sphynx skin is wrinkled in some places and silky and warm to the touch. Sphynx patterns and colours include red, black, blue-and-cream, and Siamese. As adults, Sphynxes are medium-sized cats with above-average physical strength. Sphynxes are quite sociable and affectionate. Most prefer not to be picked up and held, but they do like to snuggle up against their human companions and other pets, and the majority will lap-sit. Anecdotal evidence suggests that Sphynx cats tend to be intelligent. Though not a demanding cat, the Sphynx is not docile either. Sphynx cats tend to be very active and love to show off, engaging in amusing antics for their human companions. Friendly and adaptable by nature, they can often develop a good relationship with other cats or dogs in the household, though they prefer human companionship. Without fur for protection, the Sphynx does best in a temperate climate and should be kept indoors, as it is susceptible to sunburn and to illnesses caused by heat and cold. Otherwise, the Sphynx is known to be a robust, healthy cat with few of the genetic problems often associated with purebreds. Sphynx cats don’t have hair to absorb their body oils, so they should be bathed approximately once a week and have their ears cleaned periodically. However, because they’ve been regularly bathed since they were kittens, they tend to be comfortable with the procedure and not inclined to put up a fight the way many other cats do. 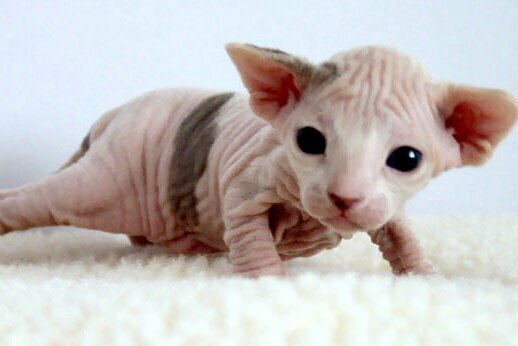 Sphynx cats are believed to be hypoallergenic due to their lack of fur, but this is not always the case. While many allergy sufferers find the Sphynx far easier to tolerate, others actually experience worse allergic reactions in response to Sphynx cats. Spending time with the cat to be adopted or other cats of the same breed to test for allergic reactions is recommended before bringing a Sphynx cat home. The Sphynx is a rare cat and extremely popular. As such, there are long waiting lists to adopt Sphynx kittens. However, Sphyx breed rescue organizations often have cats available for adoption or fostering. Schneck, Marcus, & Caravan, Jill. (1990). Cat Facts. London: Quarto Publishing plc.